The Abaco Club on Winding Bay was visited by top journalists from Nov. 7-9. The event was hosted by Peter de Savary, the founder and chairman of the club. "I was skeptical about the claim of a 'tropical links' course. Links courses are supposed to be built by the sea but that sea is supposed to be cold and grey with five changes of weather in four hours, a howling wind and wheezing old caddies speaking with burgess, and not soft lilting accents," said Jim Bartlett, senior golf writer forThe Robb Report, a monthly lifestyle magazine for the affluent. 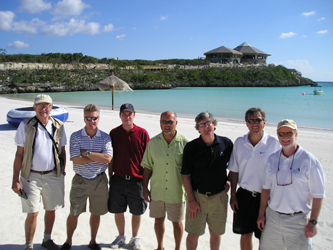 From left to right, Richard Coulson, freelance writer to the New York Times, David Gould, editor to Links Magazine, Tom Dunne, senior editor to The Golfer, Peter de Savary, founder and chairman of The Abaco Club, Jim Bartlett, contributing editor to the Robb Report, David de Smith, editor to the New England Journal of Golf and Tom Bedell, contributing editor to American Way. The Abaco Club on Winding Bay was visited by top journalists from Nov. 7-9. The event was hosted by Peter de Savary, the founder and chairman of the club. They all were invited to play a round of golf on the only tropical Scottish style links golf course in the Caribbean, and to tour the property. The writers were also asked for their opinions on the course and club which will be published in upcoming issues of their perspective persuasive and trendy magazines. David de Smith, editor of the New England Journal of Golf', a magazine that is read by golf enthusiasts, said: �The new links course at the Abaco Club is charming throughout and thrilling at many points. Its layout tracts upwind and downwind knowingly, concluding in a crescendo style with four stunning holes along a canyon and sea cliff. The course has a hand-crafted look but plenty of drama to its features, which is a difficult line to walk for any golf architect." Tom Bedell, senior golf writer for American Way, a magazine that can be found in the seat pocket of every jet and plane of the American Airlines fleet, said: �The course is very spectacular and is a unique golfing experience." He added that �the club house perched on the cliffs gives an uncompromising view of the magnificent beaches, the ocean and the last few holes will surely gratify all members and guest." With all the positive complements coming from this group of renowned, influential and highly respected writers, one would think, it can't get better than this. But it does. Tom Dunne, senior editor for The Golfer magazine, had this to say about de Savary's vision: �The golf course at the Abaco Club is being heralded as the world's first tropical links, a bold claim but one that is fulfilled. Indeed there is no course in the Caribbean quite like it. With out a doubt, the oceanfront closing will quickly take its place among the very best." He concluded. �This is no pancake-flat Caribbean resort course. The elevation changes make's for great golf; and it's also a pleasure to walk, especially with one of the club's superb and well mannered caddies." Last but not least Richard Coulson, a freelance writer for the New York Times and also the only writer in the group that resides in the Bahamas said: �I have visited many projects throughout the Bahamas, and by far the Abaco Club on Winding Bay, is the most spectacular yet. The 18th hole is sure to become the signature hole of the Caribbean." Upon receiving this salvo of highly valued compliments, Chairman de Savary said: �There is no satisfaction that eclipses a job well done, and this job could not have been done without the unwavering dedication from all involved." He also said he is looking forward to the weekend of Nov. 19-20 when the club will hold its first golf tournament that will be comprised of members and their guests, and to receive their comments on the Abaco Club. Another group of top US writers � from golf and lifestyle magazines � will be arriving the week of Dec. 13 as The Abaco Club builds up the publicity steam towards its opening.